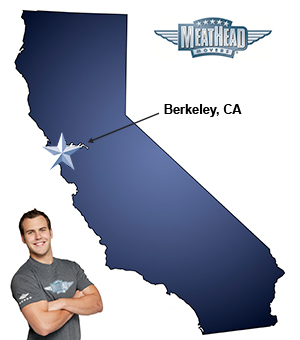 Whatever your moving needs may be, choose Meathead Movers as your trusted Berkeley movers. Our professionally trained student-athlete movers and our moving concierge will be with you for the entirety of your move to or from Berkeley. If you are planning on moving to, from or within Berkeley, our Berkeley movers can help you move to this amazing city or discover a new home somewhere else in California. Berkeley is a city of culture, education, and art. These traits have earned the community a distinguished designation as the Athens of the West. Berkeley, California is a cosmopolitan city that always welcomes new neighbors and friends. The University of California, Berkeley is one of the city’s most famous landmarks and institutions, but there are many others. This famous city on the eastern shore of the San Francisco Bay has a reputation that far exceeds its size. It consistently ranks among the most educated cities in the country, and more than one quarter of its residents are enrolled in higher education courses at any given time. Berkeley has a pleasant climate and 300 days of sunshine each year. That’s important because the city has 52 community parks. These public recreation areas include sports facilities, swimming pools, and skateboarding areas. The Berkeley Marina has berths for 1,000 boats and everything residents need to enjoy a day on the water. The city is also home to more than 130 arts groups and cultural organizations that are based near the city’s prominent art districts on Addison Street and Ashby Street. If these merits have piqued your appetite for adventure, hire Berkeley movers to transport your family’s items to a new location. Moving to Berkeley doesn’t have to be stressful if you work with the right company. Unlike other companies, Meathead Movers offers fixed-price services for long-distance moves across the state. The same crew will be there to pack and unpack your items wherever you move. Our professionally trained student-athlete Berkeley movers and our move concierge are here to help you with every stage of your move. We ensure a level of quality and customer service that can’t be beat. Our honest, all-American student-athletes are the best movers in the industry and our legendary hustle and customer service will leave you happy you chose us. On top of our first-class moving services, we also offer packing, storage, and our complimentary moving concierge service. So if you are looking for the top rated Berkeley movers around, give us a call today to request a free moving quote! With our 100% satisfaction guarantee, the only thing you have to lose is the stress that comes from moving! Moving to Berkeley? Here are some helpful resources. Friendly, eager to please and never stopped working! I kept trying to feed them and they wouldn't take breaks to eat even. Guys were so polite and helpful! The moving crew was fast, friendly and professional.